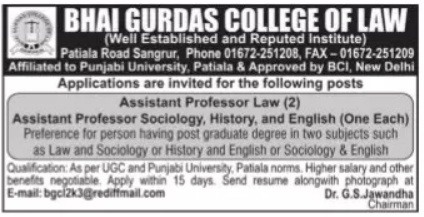 Bhai Gurdas College of Law, Sangrur has advertised in the TRIBUNE newspaper for the recruitment of Assistant Professor jobs vacancies. Interested and eligible job aspirants are requested to apply within 15 days from 06th February 2019. Check out further more details below. College Profile: Bhai Gurdas College of Law, Sangrur (Approved by Bar Council of India and Affiliated to Punjabi University, Patiala) was established in the year 2003 under the banner of Bhai Gurdas Educational Trust to cater the longstanding growing need for legal eduation with a view to facilitate students to achieve excellence, legal acumen, leadership abilities and administrative talents.TheCollege manages regular seminars and panel discussion with due emphasis on quality education ensuring future successful careers and better life prospective. Salary: Higher salary and other benefits negotiable. How to Apply: Interested and eligible candidates are requested to send CV along with copies of certificates and recent PP size photographs to the following email address.